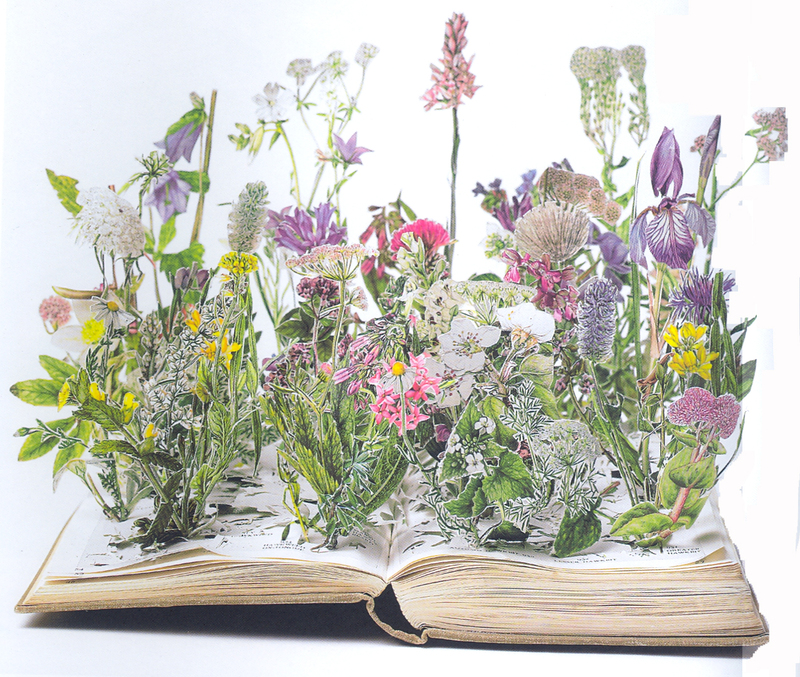 Are you looking for a new book arts project that challenges the boundaries of the traditional book form? Do you want to find unique ways to reuse old books? 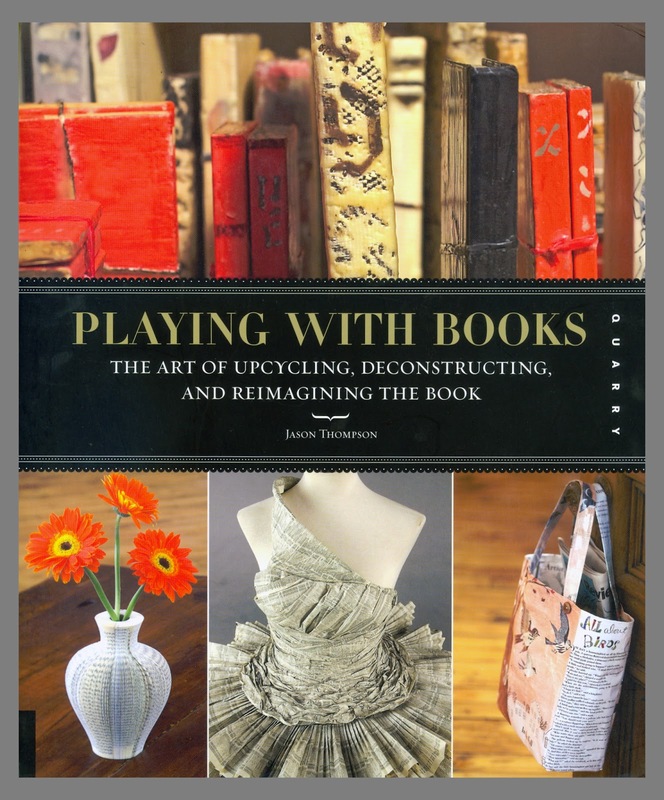 If so, I’d recommend that you take a look at this week’s Reference Collection highlight, Playing with Books: The Art of Upcycling, Deconstructing, and Reimagining the Book (REF.BB.1007). 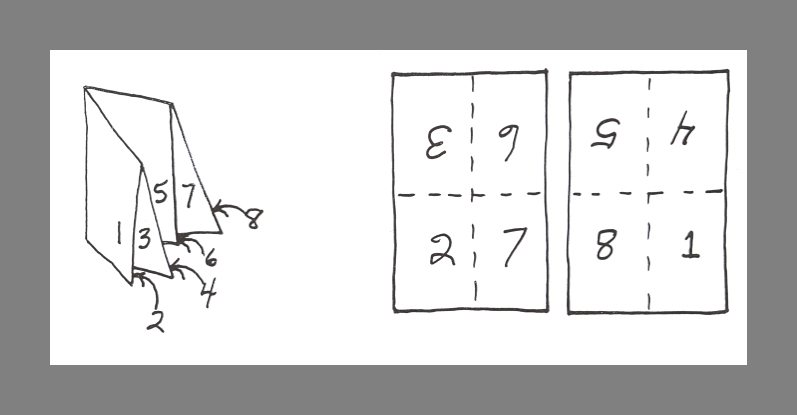 Here, author Jason Thompson explores a variety of techniques to re-imagine the book form, creating both artistic and usable artwork. As he explains, “Books are more than pages, board, glue, and thread — they are artifacts of the human spirit and hand… The following pages feature work from artists who turn the book form on its head by using bookbinding, woodworking, paper crafting, origami, textile, and decorative arts techniques…We cannot hope to save all the books from the landfill — this is a Sisyphean task. But we can be inspired by the creativity of these artists, who reinterpret both lowly and lofty books into something more. The title begins with an exploration of how to get started, detailing the adhesives, cutting materials and other bookbinding tools you might need for such projects. Readers will also learn the basic anatomy that composes a book. 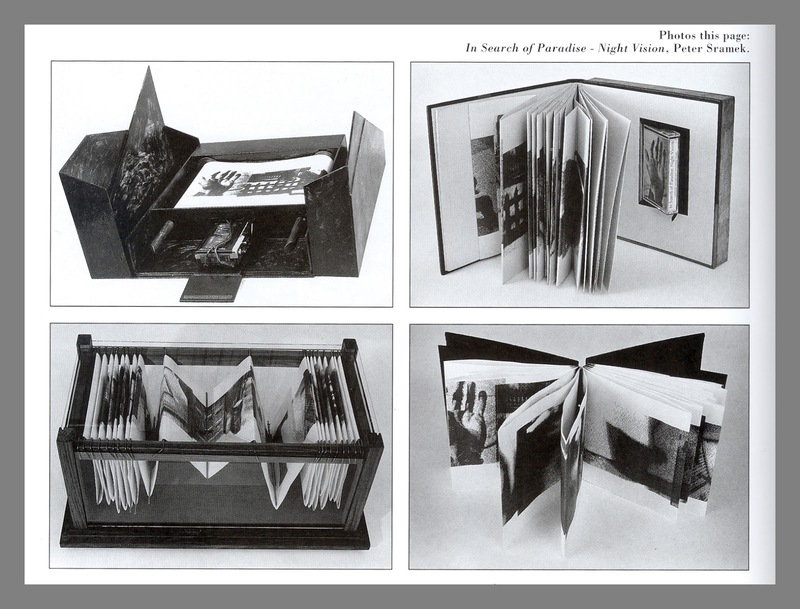 In chapter 2, Thompson explores several ‘projects to play with’, including the design of unique cards from discarded illustrated books, custom envelopes, book jacket billfolds, business card holders, beading from book pages, hardcover book clocks, punched paper ornaments, and rolled book page frames, among others. 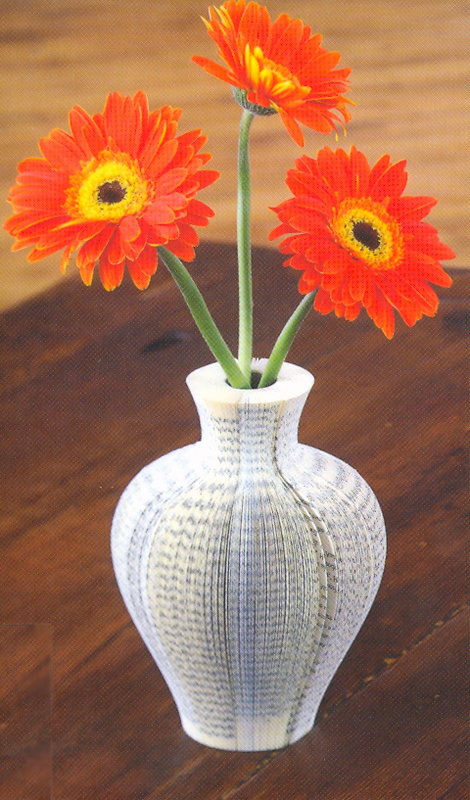 One project highlight involves the use of power tools to shape books into usable objects such as a floral vase. Chapter 3 explores artist profiles that highlight methods to reimagine the book into alternate forms. Here, the reader will view projects such as an altered set of encyclopedias cut in the form of the human head, a title with a hidden ring inside the book’s pages, a book with wildflowers cut into a pop-up shape, and even a volume cut to represent a burning fire. Other examples are used to explore topographical changes, view building structures, and even to create music boxes. Each project is meant to excite the imagination of the reader, providing inspiration on the many variations and meanings that can be accomplished when artists reach beyond the traditional structure of a book. More than 35 book artists are represented in this title, including Nicci Cobb, Jacqueline Rush Lee, Guy Laramee, Mike Stilkey, Thomas Allen, Doug Beube, and Nicola Dale. Whether you are seeking inspiration for a unique project, or whether you simply want to explore the boundaries of the book form, this title would be a great place to start. The Reference Collection is one of three collections at The Center for Book Arts. The other two include the Fine Arts Collection (composed of artists’ books and prints) and the Archives (containing Exhibition Catalogs and the Center’s ephemera). All three collections can be viewed on-line via the Center’s website or in person by appointment. Note that the Reference Library is currently being cataloged, with roughly 80% completed. 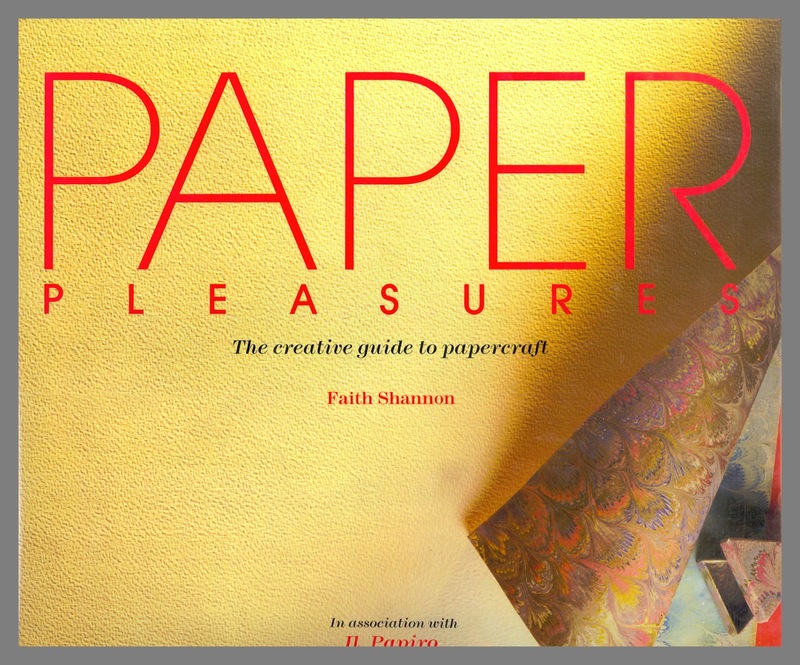 If you’re interested in papercraft, this week’s Reference Collection highlight, Paper Pleasures: The Creative Guide to Papercraft by Faith Shannon (REF.PT.1120) just might be for you. 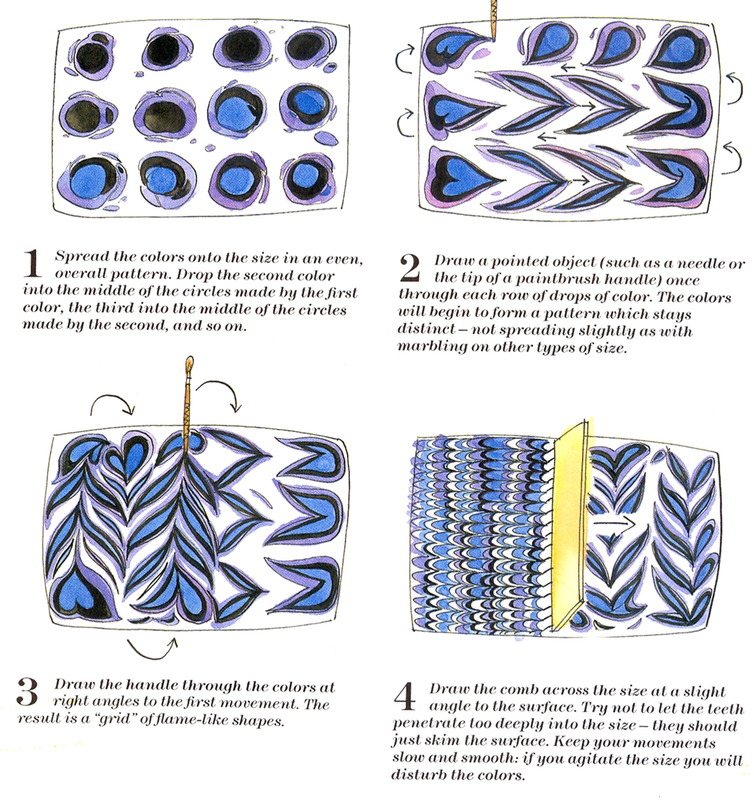 Here, Shannon illustrates papermaking, marbling, and decorative paper techniques through more than 100 color photographs and 200 step-by-step diagrams. The title begins with a historical survey of paper, exploring its precursors and origins. Here she delves into the differences among hand papermaking procedures in the East and West, as well as some early experiments in production methods. paper from leeks, onion skins, rhubarb, etc. 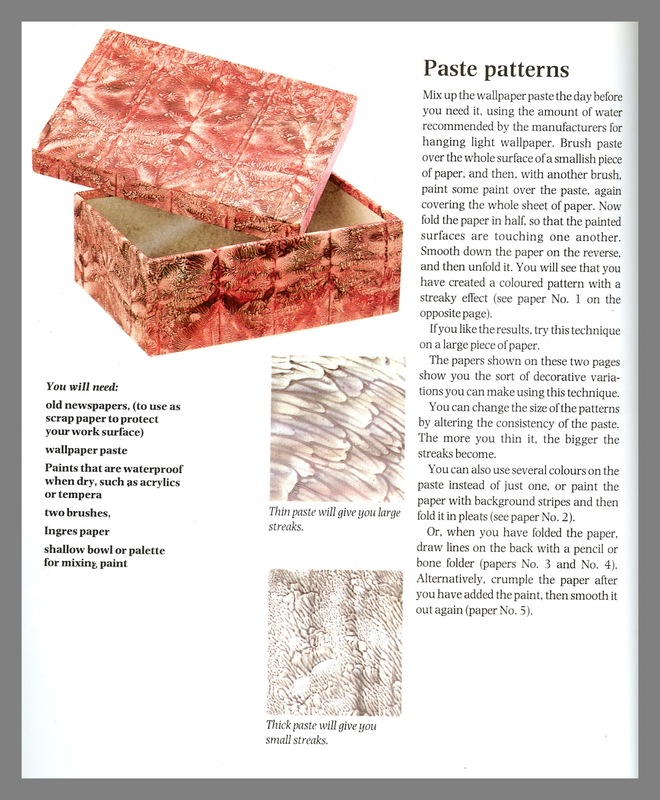 The second section of the book explains how to make paper using readily available materials found at home. Here, the reader will learn how to set up the mold and deckle, how to create a basic paper press, and how to create the pulp. They will also explore varying plant materials that might be used to create paper, and the techniques required to breakdown tough materials into usable fibers. Other topics covered include making large sheets with a small frame, drying techniques, and possibilities for manipulating the appearance of paper (such as watermarking, coloring, and patchworking). Next, Shannon delves into decorative paper techniques. Here, the reader will learn how to create their own patterns by hand through methods such as paste and color, spattering and spraying, resist pattern and color wash, block printing, and monotype. The methods described require very little in the way of equipment, and no previous experience. Section five discusses marbling techniques. As Shannon explains, the simplest way to marble paper is to take advantage of the reaction of oil and water, buy provigil with a credit card which do not mix. Experimenting with varying types and densities of oil paints are therefore ideal means for a beginner to create various effects. The chapter also explores the classic marbling method which involves floating watercolors on a gelatinous size made from carrageen moss. Paper in Three Dimensions breaks down the basic skills of cutting, gluing, and measuring required to begin making and covering three-dimensional objects. The chapter also provides a number of examples which build upon these basics. Projects include covering boxes, trays, and geometric forms; creating lampshades, blinds,and screens; working with paper mâché; molding jewelry; making cards, gift bags, folders, and wallets; producing frames, desktop projects, and decorative table tops; and using patterns to create art for display. The final chapter covers the basics of making books. Here, the reader will learn how to create simple books and covers; basic binding techniques; and more advanced alternatives such as the accordion-pleated book, and multi-section books. Also featured are three projects that bend the basic rules to create more abstract works of art. The title also includes a brief reference section consisting of a glossary, useful addresses, a bibliography, the index, and credits. Produced in conjunction with the well known Florentine marbling firm, Il Papiro, this title provides a solid primer for readers new to the paper arts. Whether you are interested in marbling, bookmaking, paper making, or other decorative paper arts, this title would be a solid tool to get you started. 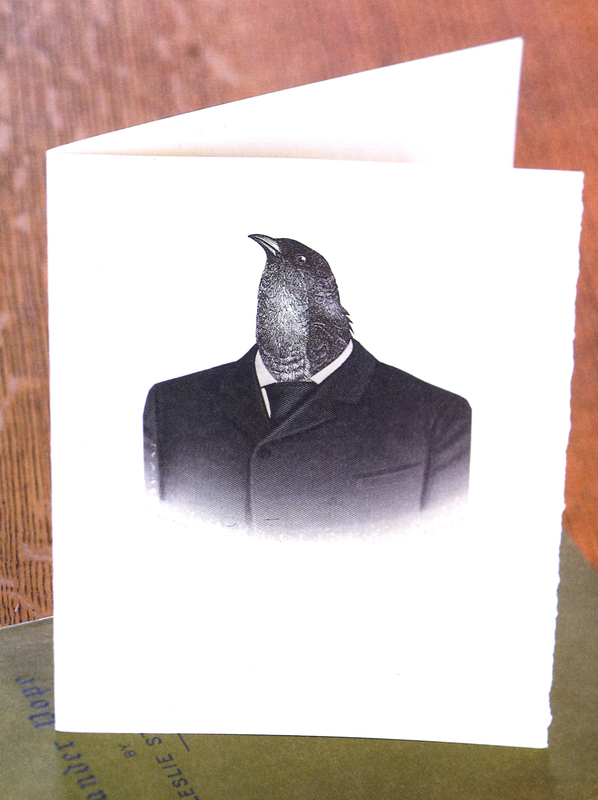 The Reference Collection is one of three collections at The Center for Book Arts. The other two include the Fine Arts Collection (composed of artists’ books and prints) and the Archives (containing Exhibition Catalogs and the Center’s ephemera). All three collections can be viewed on-line via the Center’s website or in person by appointment. Note that the Reference Library is currently being cataloged, with roughly 75% completed. 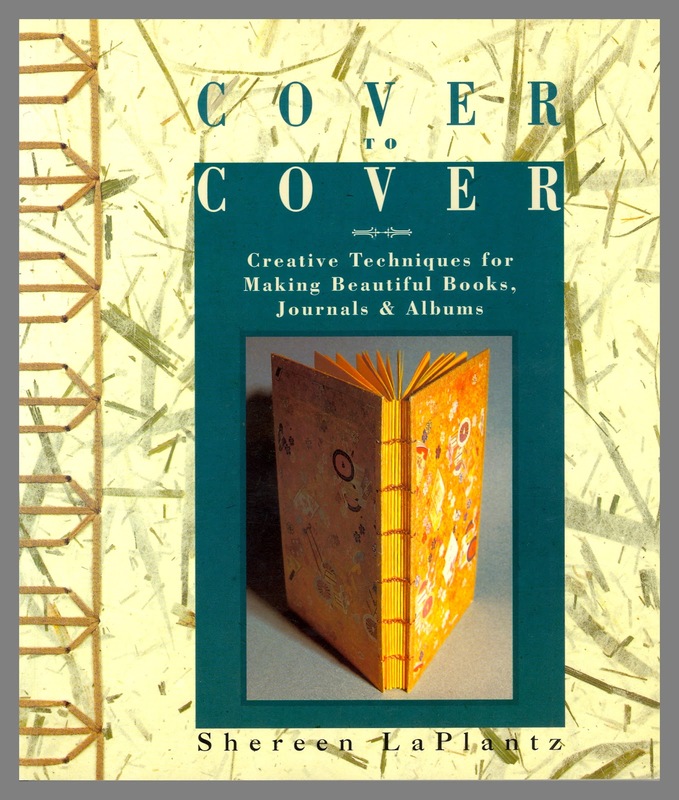 This week’s Reference Collection highlight is “Cover to Cover: Creative Techniques for Making Beautiful Books, Journals and Albums” (REF.BB.0830) by Shereen LaPlantz. The title provides a step-by-step guidebook for the book arts beginner, taking the reader through the process of creating a variety of books, journals, and albums. 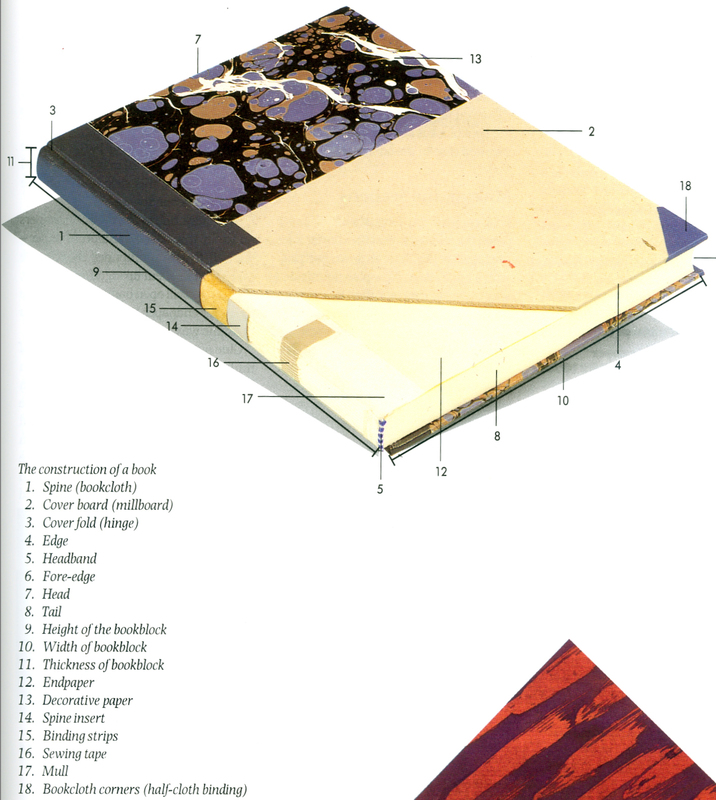 The book is divided into three main sections covering bookbinding basics, techniques, and presentation. The first chapter explores the papers, boards, adhesives and other materials that go into the creation of a book, as well as the tools and techniques required to assemble them. Here, the reader will learn just what it is that makes a quarto; how to tip in a single page to a book; and how to make wheat starch paste in a microwave. The second section deals with binding structures and techniques. Here, the reader will begin by learning about the pamphlet stitch, perhaps the easiest and most versatile technique to use in bookbinding. Building upon these basics, the book then moves on to discuss the structure of the basic codex (the type of book most of us think of), and then to an exploration of various stitching patterns. Further chapters cover stab bindings, fold books, combination books, and unusual bindings. LaPlantz closes by encouraging the reader to take everything learned from the book and adapt it to his / her own tastes and styles. This, she explains is one of the greatest joys in art – that of transmutation. With more than 170 photos to provide inspiration and hundreds of illustrations accompanying the detailed instructions, this book will guide the reader through all the steps needed to create handcrafted journals, albums, and books. This title would serve as a valuable reference for both the beginner bookbinder and the enthusiastic artist looking for project ideas. 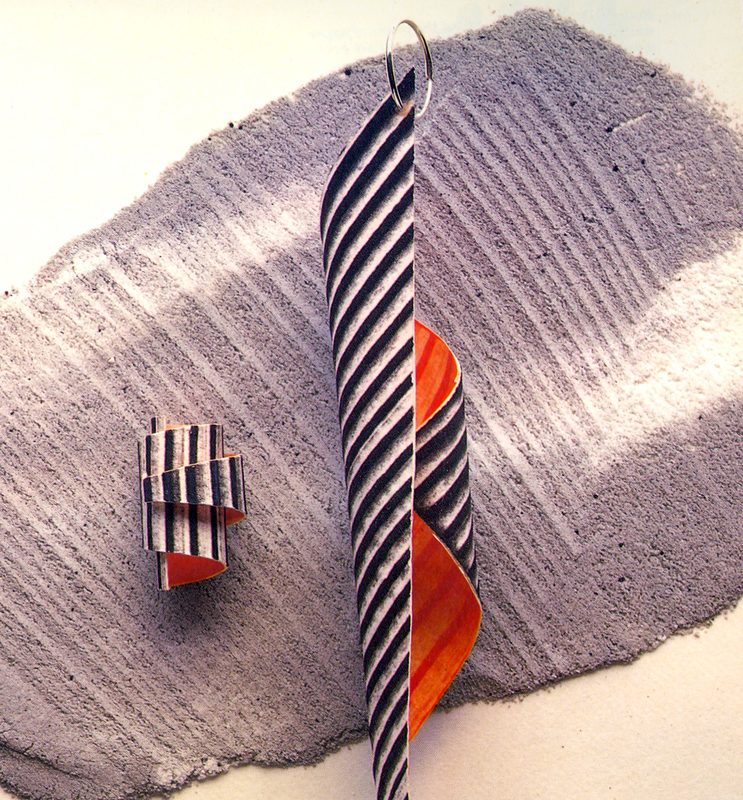 The Reference Collection is one of three collections at The Center for Book Arts. The other two include the Fine Arts Collection (composed of artists’ books and prints) and the Archives (containing Exhibition Catalogs and the Center’s ephemera). All three collections can be viewed on-line via the Center’s website or in person by appointment. Note that the Reference Library is currently being cataloged, with roughly 60% completed. As Morgan has put so elegantly, books have the rare quality of both providing a venue for deep exploration by the author / artist and of sharing those explorations with the outside world. For anyone without a formal training in bookmaking, however, the process of actually creating your own book can be a bit daunting. This is where Peter Baumgartner has come to help. 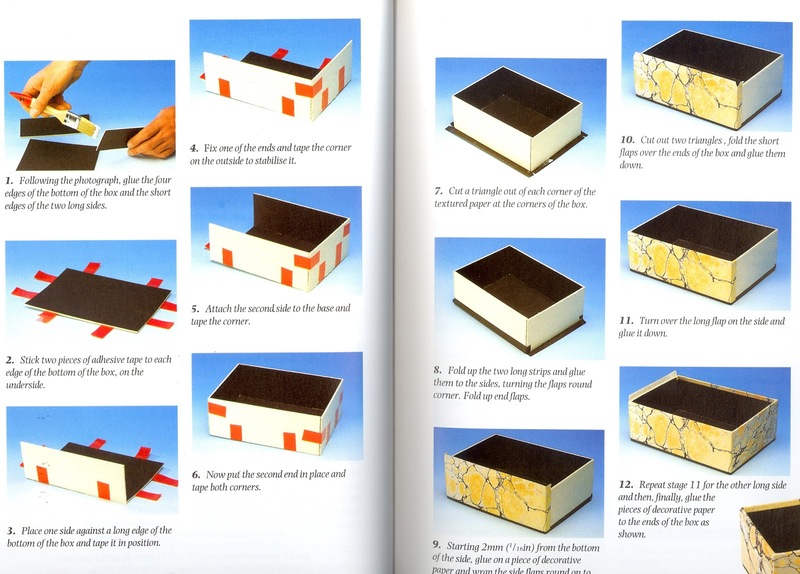 In this week’s Reference Collection highlight, “Make Your Own Books and Boxes: Portfolios, Photograph Albums, and Decorative Papers” (REF.BB.0091), Baumgartner provides a step-by-step manual to help demystify basic bookmaking techniques such as sewing, binding, and making covers. The title begins with a brief history of books beginning with the Egyptian papyrus and continuing through to the creation of the mass paperback. 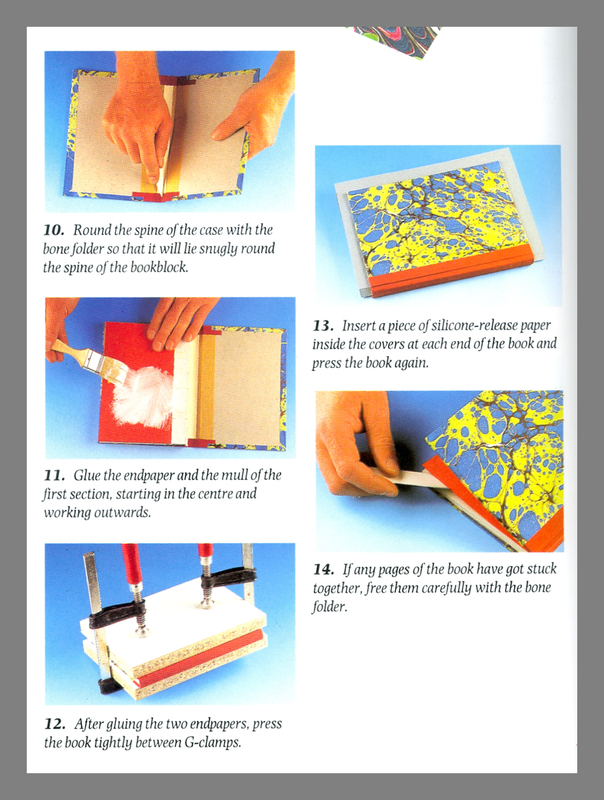 Next, the reader is introduced to bookmaking basics such as paper characteristics, sizing, grain, and weight; materials and tools required for bookmaking; and key techniques such as gluing, cutting and measuring. 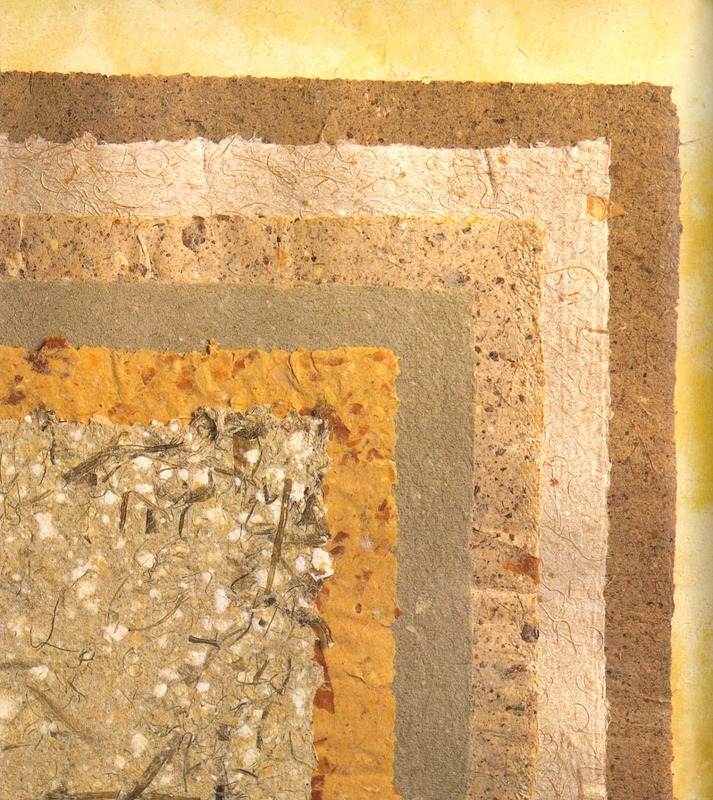 Decorative papermaking techniques such as paste patterns, batik paper, and marbled paper are also explored. 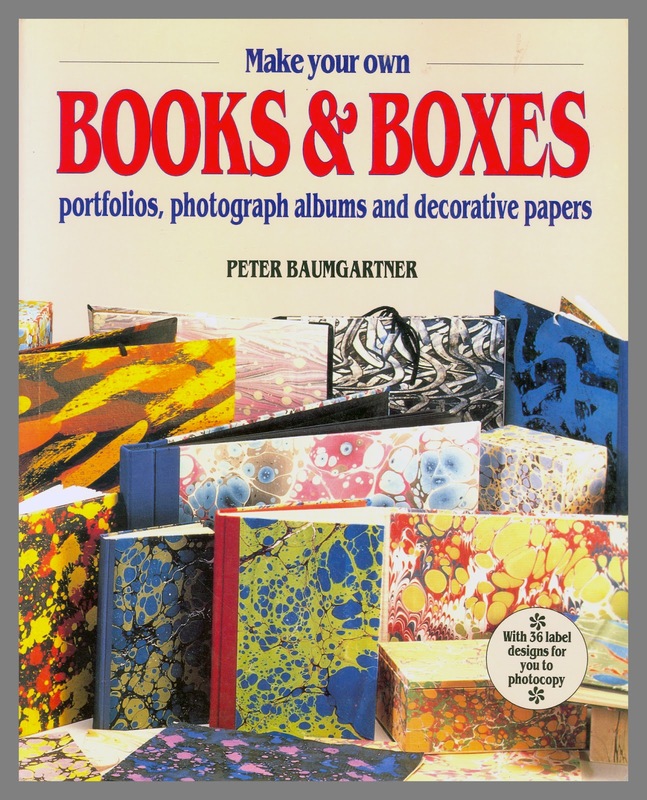 Baumgartner then delves into an introduction of techniques for creating notebooks, boxes, portfolios and albums. 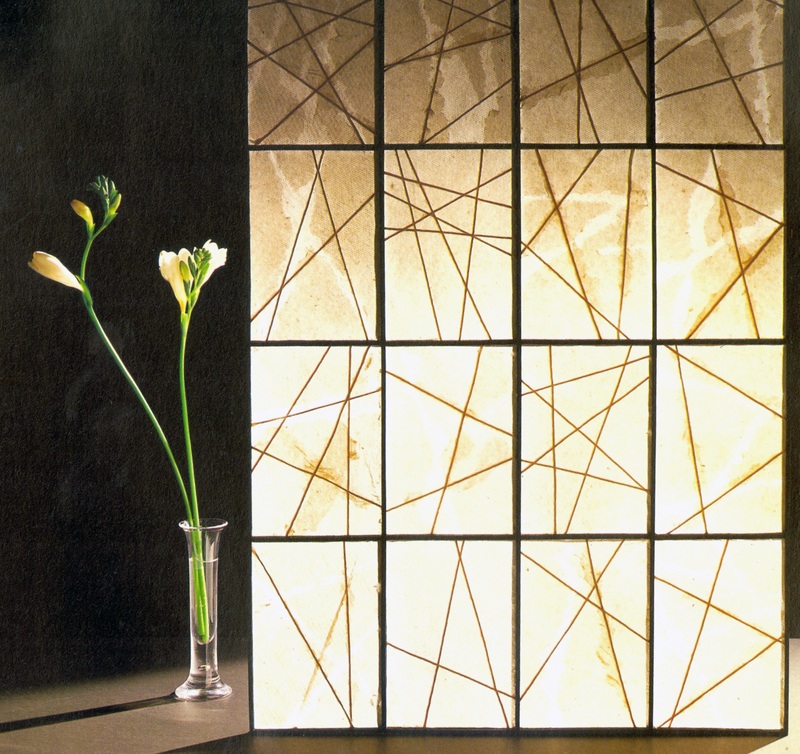 Each project begins with a summary of the steps involved, as well as a list of requisite materials. 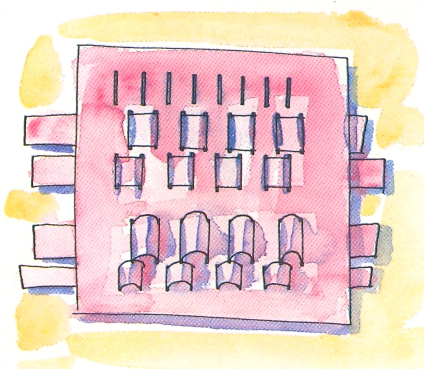 Full-color illustrations are contained throughout, as well as brief tips on how to avoid common technique errors. Readers are next taken through the process of creating their own books. 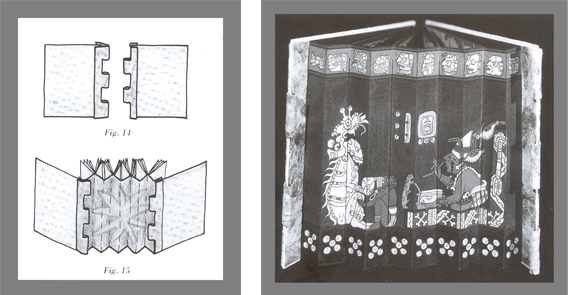 This section covers the creation of the book block, making the case, casing-in, ‘perfect binding’ single sheets, full cloth binding, and full binding with paper. The title ends with a discussion of how to repair your own books, covering topics such as repairing damaged corners, strengthening the binding on a perfect-bound book, restoring covers, and removing damaged sections. 36 decorative label templates are also included, and can be photocopied for your own projects. If you’re looking to get started making your own books or boxes, or if you’re just curious about the process, this title would be a great place to start. 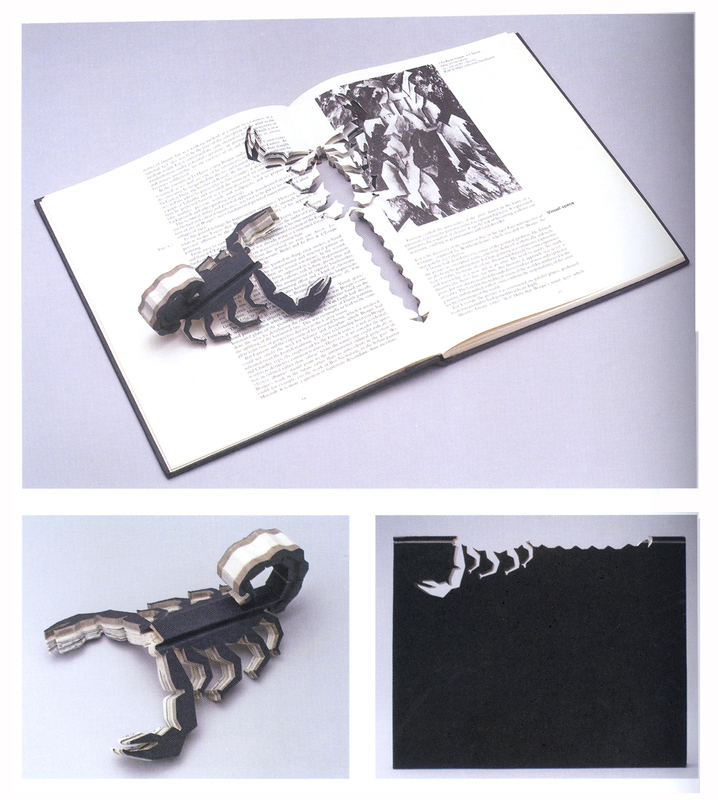 The Reference Collection is one of three collections at The Center for Book Arts. The other two include the Fine Arts Collection (composed of artists’ books and prints) and the Archives (containing Exhibition Catalogs and the Center’s ephemera). All three collections can be viewed on-line via the Center’s website orin person by appointment. Note that the Reference Library is currently being cataloged, with roughly 60% completed. I began interning with the Center for Book Arts just three days ago, and already I have become enamored with the variety of resources available in the Reference Collection here. The collection offers titles ranging from international exhibition catalogues on artists such as Doug Beube, Maturo Molinari, Bard Breivik, and Joyce Cutler-Shaw to instructional manuals covering techniques such decorative papercutting, fabric marbling, calligraphy, and photo engravings, as well as typography specimen books. Each day, I uncover new works of interest, and it can often be challenging not to simply spend the day reveling in the pages of each new book. 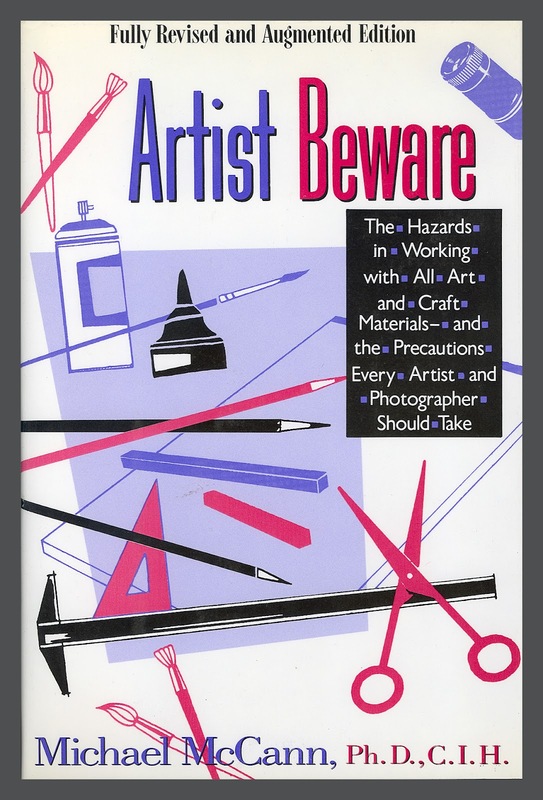 One particularly significant title I have uncovered so far is Michael McCann’s Artist Beware: the Hazards in Working with All Art and Craft Materials and the Precautions Every Artist and Craftsperson Should Take. The book includes an examination of the way that gases, vapors, dust, and fumes might harm an artist, and discusses aspects of safety in the studio that include proper care, handling, and disposal of materials; types of protective equipment; and potential physical hazards. Part I provides a general introduction to common chemical and physical hazards found in art and craft materials and processes, as well as recommended safety considerations when setting up a studio. Part II then breaks down by artistic area, indicating potential safety hazards and recommended safety actions. Types of art discussed in this section include printmaking, woodworking, metal art, jewelry and enameling, photocopier art, computer art, textile art, photography, painting, glass art, sculpture, and ceramics. Within each section, McCann provides detailed safety measures for various elements involved in the process. For instance, the printmaking section begins with a discussion of the potential hazards of the inks and printing processes involved in printmaking. Further details are then provided on the specialized concerns in the areas of lithography, intaglio, relief, and screen printing. With its thorough recommendations on safety setups, this title would provide an essential starting point for any new artist looking to become involved in printmaking or in one of the other artistic areas highlighted in McCann’s work. As the semester continues, I look forward to uncovering further highlights of the reference collection, and to sharing some of them with you over the coming weeks. The Reference Collection is one of three collections at The Center for Book Arts. The other two are the Fine Arts Collection including artists’ books and prints and the Archives including Exhibition and the Center’s ephemera. All three collections can be viewed on-line via the Center’s website. The collections can also be viewed in person by appointment. Note that the Reference Library is currently being cataloged with approximately 40% completed.